Although most of the famous historical replicas are not yet constructed, Nayong Pilipno is still a great place to visit for family bonding, just like what we did. From the North Luzon Expressway, take Dau Exit. Turn left to McArthur Highway, then turn right to Clark Main Gate. Juan has been shaking his front tooth the last couple of weeks. I told him to stop doing that because the tooth will eventually fall off if it's time. Though I have told Juan many times to stop shaking his teeth, I'd catch him doing it from time to time. About five days ago, my husband told me that Juan's tooth finally fell and to put money under Juan's pillow as a gift from the tooth fairy. I completely forgot to do just that because I was dead tired from the hosting I did that afternoon. Juan: Mom, is it okay if I just make a card or a letter for you as Christmas gift? Me: Sure, my love. Anything from you makes me happy. Juan: E, kasi, Mom, I was going to buy you a gift but I have no money. I was looking forward to having money but the tooth fairy forgot to put money under my pillow. I felt happy and sad at the same time. Happy because my son, at 6 years old, would pull his teeth to have money to buy me a gift. Sad because I forgot to do the job of the real tooth fairy. Me: What would be your last words in case the world ends tomorrow? Rafael: I wish I had more time. Julia: I'm too young to die! Juan: Not on the neck! Of course we all laughed at Juan's weird last words. Me: Why not on the neck? Juan: Because I don't like to die with with tusok on my neck. Me: Where do you want to be tusok? Juan: Hmmm, maybe just on my feet or my leg, but really not on my neck. Me: You know what my last words will be? Julia, Rafael and Juan: What, Mom? you and will be loving you til the end of the world. We all do not know what's in store for us in a few hours. I just like to take this opportunity to thank you all, my dear readers, for keeping me company as I share stories in this humble blog. To all of you who have been part of my life, I LOVE YOU! The theme of iSuites is Asian, Oriental. In keeping with the Japanese theme, Mika decided to assign certain terms that are associated with the Japanese culture so the hotel rooms are called Kimono, Mikado, Sakura, Zen, Taka, Geisha, Shinden, Haiku, Emeperor, Shogun, Sake, and Geta, instead of numbers. The Kimono rooms, the simplest of all the room types, have a double-sized bed, a false veranda and LCD TV with HD channels. Rates for this room start from P1,500. Guests staying in premium rooms (Sakura, Zen, Taka, Geisha, Shinden, Haiku, Emeperor, Shogun, Sake, and Geta) and the Mikado room, have safety boxes where they can keep their valuables. The Geta rooms and Sake rooms, whose rates start from P4, 900, are actually two-level units. They are equipped with their own living room, kitchenette, dining, mini bar, HD TV, double-sized beds and single beds and toilet and bathrooms. All rooms come with free Wi-Fi access and with complimentary breakfast meals at the hotel’s restaurant, Tatami. At Tatami, guests can partake of Japanese food fare and other Asian dishes. On weekdays, iSuites have a lunch buffet serving home-cooked dishes, priced around P60 to P90 per dish. Good old Vigan favourites have also found their way into the Tatami menu such as bagnet, Vigan longganisa, and pakbet. iSuites also offers extended stays and long-term monthly rental accommodations. Rooms for this type of rental come with their own electric meters, so guests can monitor and take charge of their expenses on utilities. iSuites also offer huge discounts for clients staying longer than six months. After their sixth month, forty percent discount applies. But the best selling point of iSuites, is their personalized service that would set them apart from other boutique hotels. For inquiries, bookings, and reservations, call 376 4750 or visit www.isuites.com.ph. How about you? Are you going to be in a space of FEAR or a space of LOVE come December 21, 2012? John Calub, the Philippines’ number one success coach has come out to the public, in a recently held press conference, to boldly declare that there is no reason to be afraid on December 21, 2012. John Calub exclaims that only God knows when the world will end. He cites a Bible verse that reads, ““However, no one knows the day or hour when these things will happen, not even the angels in heaven or the Son himself. Only the Father knows. (Matthew 24:36)”. With the vision of moving people from fear back to love (our true essence), John Calub has gathered the country’s best motivational speakers to do a live conference and celebration called TURNING POINT 2012, which will happen on December 21, 2012, 1:00 pm to 12:00 am at the SMX Convention Center, Mall of Asia, Pasay City. According to John, instead of being afraid, why not make December 21 a major turning point of your life and move yourself from poverty to abundance, suffering to happiness and failure to success. Be empowered in the Turning Point 2012 conference by Pido Aguilar (Best-selling author of the book Abundance), Dr. Christian Mancao (Pain Management Expert), Paolo Trinidad (Founder of Pinoy Laughter Yoga), Sainayah Gurnamal (Life Coach and Healer), Tony Suvega (Feng Shui Master), Dr. Kevin Plata (Clinical Psychologist), and much much more! Also, get amazed and entertained by the laser light display and magic show of master illusionist JB Dela Cruz. Plus song and dance numbers from D-Coy and various artists. One of the highlights of the Turning Point 2012 Conference is the Hug Festival, where thousands of Filipinos will hug one another in a designated time in the spirit of love, peace and harmony. John Calub hopes to grow Hug Festival into an annual activity and soon make it to the Guiness Book of World Records with the record of the having the most number of people hugging at a time and longest hug chain ever done. Breastfeeding is an advocacy I am committed to. Yes, I'm still and proudly breastfeeding Juan! When I was breastfeeding the twins back in 2002, I feel and look lousy and big. This time, wearing Mommy Matters Nursing clothes makes me feel better and sexier. I'm sure my Mommy Blogger friends agree with me. Mommy Matters is one of the leading pioneer nursing wear brands in the Philippines. Its apparel is known for its high quality, wearable fashion and our constant innovations to answer our market's needs and wants. Santa’s Christmas Bazaar @ La Vista, Year 7! 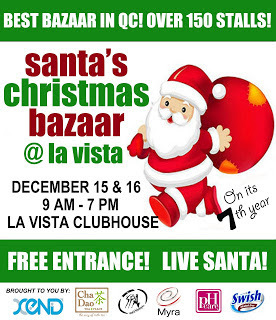 Get to finish all those Christmas gift list by visiting Santa’s Christmas Bazaar @ La Vista on December 15 – 16, 2012 for the biggest bazaars in Quezon City. with over 150 participating concessionaires. This is also one of the most awaited bazaars due to the large numbers of shoppers, bulk buyers and after-event sales. It will be at la Vista Clubhouse and Basketball Court, Katipunan, Quezon City from 9 a.m. to 7 p.m.
PRE-REGISTER: Email your full name and mobile number to claudbaron@yahoo.com. DROP by the Organizer’s Booth and claim your FREE samples! No catch, no need to buy anything. Just pre-register and get the samples for free!!! Twins Julia and Rafael are in the stage where they know what they want. As good children, they always ask John and I if they need or want something. For their 10th birthday they both ask if they can have a slumber party with their friends. And that's what we gave them. Julia invited 5 but Angela couldn't make it for a singing commitment at Manila Pen. Audrey went home around 10pm. Pearl, Akky and Sam stayed overnight. Rafael invited 3 friends, only Keiran made it but left around 9pm for a family gathering. 1. Choose the venue. Normally, slumber party's venue is at home but my kids specifically asked to have their sleepover at The Legend Villas. 2. Pick a number of guests to be invited. Whether the venue is big or small it is advisable to keep the number of kids below 10 to manage them well. Send out invites at least a week before the party. Specify in the invite drop-off and pick up date and time. 3. Plan games and activities that will fill the the kids schedule to battle the "I'm bored or it's boring " lines from the kids. You may also pick a theme for added fun. I specifically asked the parents to leave their children's tech gadgets (Ipad, PSPs etc.) at home because I prepared activities to keep them busy and happy. 4. Know the basics, vitals of the kids and lay rules. Get in touch with the parents days ahead to get information on allergies, sleeping habits and other important considerations. Lay the rules and guideline like no fighting over who's sleeping beside who, no teasing that will hurt somebody's feeling. I did not allow the kids to open the television the whole day. At 10:30pm I allowed them to watch some cartoons to wind them down. By 11pm, the girls are all asleep. 5. Prepare food that the kids will surely like. Prepare bring home goodies. 6. Last but not the least, play and enJOY the slumber party with the kids! Warning: What you are about to read is not the usual occasions of joy stuff but it's a must that I share this to protect the cab riding public and most specially to get the attention of LTFRB. I rode a taxi, with plate number UVD 431, last October 19, 2012 at 6pm from Aquinas School going to Ortigas. Me: Kuya, Ortigas lang po. Driver: Plus thirty po tayo ha. Me: Kuya, diba may P40 na, para saan po ang plus thirty? Driver: (rudely talking) ang traffic e. Di nga sana kita isasakay e.
Me: Naku, Kuya, diba bawal yan. Ako naman ay may kusang tao. Madalas nga po, pag mabait ang driver binibigyan ko pa ng food at water. Tingnan muna natin kung traffic nga. Driver: (rudely murmuring and recklessly driving) basta, plus thirty tayo ha. Me: (quietly sitting then txtd my Lani to save UVD 431. Sensing something bad about this driver, I called my husband) Dad, I'm almost at my destination, please save this taxi plate UVD 431. When we arrived at my destination, he was still rudely reminding me of the plus thirty. Me: Kuya, di naman ako nag-agree dyan sa plus thirty mo. Tsaka bawal yan. Driver: Ah basta, plus thirty. Me: Alam mo Kuya kung mabait ka lang, di lang plus thirty ibibigay ko sayo. Then he shoved my left shoulder using his right hand. He was pushing me out of the cab. Me: Hindi, Kuya, pag-usapan natin to. Bastos ka e, Recless driver pa, at bakit mo ko tinutulak. The right door was already open because I was waving and calling out to the guards when this rude driver drove so fast while pushing me out of the cab. I almost fell out of the door. Then he stopped and shoved me harder out of the cab. I realized that this driver will kill me if I don't alight from the cab, so i went down hurriedly. When I reached home after 2 hours, my husband accompanied me at Mandaluyong Police Station. I reported the incident but was told to go to San Juan Police Station because it's their jurisdiction. At San Juan Police Station, PO3 Clifford Hipolito assisted us well. He promised to raise the incident to LTFRB since it is an LTFRB case. It's almost 2 months now, I am still waiting for LTFRB to give me feedback about this cab driver and its operator. And by the way, I txtd LTFRB about this terrifying incident last October 19, 2012 at exactly 11:40pm. E, ni who's this please wala man lang txtback. KNOCK KNOCK, LTFRB, MAY TAO PO BA SA OPISINA NYO? I've decided to write about this horrifying incident to get the attention of LTFRB para naman mabawasan ang mga LOKONG DRIVERS NA YAN! Kasi kung hindi, di mababawasan ang mga nakakasindak na insidenteng ganito...Re-posting the article below I read from an FB friend's wall early this morning. K: sira po ba metro nyo? K: I-metro na lang kuya kasi ayan o (pointing to opposite road), Hindi po traffic. Sa MOA area po ako araw-araw memorize ko na po ang traffic dito. Driver agreed and drove. We got to MOA and meter flashed P57.50 to which I gave P100 expecting to get a change of P40. Driver said he doesn't have change and showed me a wad of P100 bills. I said I will try to exchange for smaller bills from the store across. He said "ok pero hindi ko ititigil yung metro ha". Sensing that this wasn't going anywhere I quietly wrote down his details (painted on the door) then gave him my P100. I said, "Kuya ito na po ang P100 so basically parang nagdagdag nga ko tala sa inyo. Next time po magdala kayo ng panukli kasi taxi po kayo". I went down and took photos of his cab. When he saw me taking photos, he went to me, towered over me and said "Maam ano hong problema nyo?" to which I replied "ang problema ko Kuya, wala kayong panukli kaya irereklamo ko kayo". Driver said "kung magrereklamo kayo maam halika sasamahan ko pa kayo pero sinabi ko na sainyo wala ako panukli di ba!" Then I said "ay wag na ho kasi napicturan ko na naman kayo so irereklamo ko na lang kayo sa kinauukulan". Driver said in a loud voice "o sige eh di magreklamo ka,para malaman mo kung Sino ang me ari ng taxi na to!" furious I shouted "ah at tine-threaten mo pa ko ha! Guard, guard hinaharass ako nitong driver na to! Bumaba pa sya sa taxi nya para tanungin kung anong problema ko at ngayon tinatakot pa ako!" A guard came over, driver was explaining that 'he does not have barya" then another guard came. This time driver said "di ko nga po alam ano problema nya kasi binabalik ko na yung pera nya oh, ito na pera mo!" I said "excuse me Kuya ngayon nyo lang binalik yan, pero sayo na yan kasi wala na kong pakialam dyan dahil nga sabi mo wala kang panukli di ba. Basta ang gagawin ko irereklamo kita!" He kept yapping and yapping then drove off. If he wasn't greedy in the first place, I would've let it go. But to say that you have no "loose change" just to clearly extort money is deception, and I will not let it pass. A week ago I was invited to join Walter Bread Cook-Off. I immediately said yes to this invitation though I've tight schedule for December 2 because Walter Bread is so close to my heart. I've told this many times before, I don't cook much. I can only cook afritada, chicken curry and beef steak, but when it comes to preparing bread for my kids, I know I can never go wrong. The host asked, "why do you think your entry will win?". My 'pang' Mrs. Philippines answer, "I don't cook much but when I prepare bread for my kids, I make it sure I put so much love into it. I start by cutting the bread into heart shape and I always make sure I use the freshest ingredients, like Walter Bread Sugar Free, vegetables and fruits on the side". Malamang, if my friend, Nora, was there she'll say. "Boom, panalo ka talaga Joy Hirit! ", because that's what we do when our team 'The Traveling Adobo' go out-of-town. With the guy who beat me for the first place. My entry for this event, Malunggay-Tuna Sandwich, which won me 2nd place among the 7 contenders (not bad eh, for a Mom who's not much into cooking). Malunggay-Tuna Sandwich served two ways: for my kids baon and for snacks. After cutting the bread into heart shape, two sides are left. This is the part that I eat. For this cook off, I gave it to the audience for tasting. The edges of the bread goes to our dog, Dengue, and the birds who visit us in the morning. This is probably why Dengue is so big and always mistaken for an imported dog. Each person has a story to tell just waiting for someone to listen. Sometimes, the stories we hear from strangers or acquaintances are like answers to questions that keeps playing on our head. Last week, as I wait for my turn to mail the Baptismal card and gift to send to my Goddaughter in Canada, I met this wonderful 73 year old woman as she was signing on the post office logbook. I wanted to help her and so I asked, "can you see well enough, Ma'am?". Instead of answering me with a yes or no, she told me this story: One day I went to my doctor and he said, "what am I going to do with your eyes?". I was afraid and thought I needed an operation. Then the doctor said, "your eyes are perfect, 20/20 vision. You just need an eye drop from time to time to sooth the dryness". I asked her secret for having clear vision. She said never to wash the face upon waking up. Wait for about an hour or more before doing so. I joked, "it's too late for me now. I already have 125/125 vision. 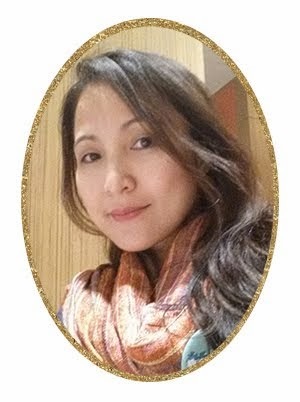 Her practice of not washing her face upon waking up may not have scientific and medical back-ups but what I learned from her was more than that. At 73, with 8 children, widowed since 2008, she still enjoys life to the fullest. She told me about her kids and their good behavior. She continued, "children don't need much. What they need is enough love, appreciation, understanding, and time from parents for them to grow up secure and loved. And I said, Amen to that! Why am I writing about this? For months now, I've been contemplating on going back to the corporate world come January 2013. Not that there's a financial need for it. It's just that, I've been getting invitation from different companies to join them. Positions such as Events Director, Marketing Manager and Training Manager with huge compensation is very tempting. Then I met her...What she told me was like an answer coming from the heavens above. It made me realize that there will be plenty of people who can handle the positions being offered to me but my children will only have one mother to love and guide them as they grow. Hmmm, maybe when my children are in college I'll go back to work. For now, I'll keep myself busy by sharing thoughts and stories that hopefully inspires and help anyone who come across this blog.